1 A None No Power Seat 1 A is a standard Diamond First Class seat. However, the proximity to galley and lavatory may be bothersome. 1 D None No Power Seat 1 D is a standard Diamond First Class seat. However, the proximity to galley and lavatory may be bothersome. 1 G None No Power Seat 1 G is a standard Diamond First Class seat. However, the proximity to galley and lavatory may be bothersome. 1 K None No Power Seat 1 K is a standard Diamond First Class seat. However, the proximity to galley and lavatory may be bothersome. 12 C None No Power Seat 12 C is a standard Pearl Business Class seat that is missing a window. 12 H None No Power Seat 12 H is a standard Pearl Business Class seat that is missing a window. 13 A None No Power Seat 13 A is a standard Pearl Business Class seat. 13 K None No Power Seat 13 K is a standard Pearl Business Class seat. 14 C None No Power Seat 14 C is a standard Pearl Business Class seat. 14 H None No Power Seat 14 H is a standard Pearl Business Class seat. 15 A None No Power Seat 15 A is a Coral Economy Class seat that may have some extra legroom due to the bulkhead position. The tray table is in the armrest, making the armrest immovable and slightly reducing seat width. 15 B None No Power Seat 15 B is a Coral Economy Class seat that may have some extra legroom due to the bulkhead position. The tray table is in the armrest, making the armrest immovable and slightly reducing seat width. 15 C None No Power Seat 15 C is a Coral Economy Class seat that may have some extra legroom due to the bulkhead position. The tray table is in the armrest, making the armrest immovable and slightly reducing seat width. 15 D None No Power Seat 15 D is a Coral Economy Class seat that may have some extra legroom due to the bulkhead position. The tray table is in the armrest, making the armrest immovable and slightly reducing seat width. Passengers traveling with infants are often seated in this row. 15 E None No Power Seat 15 E is a Coral Economy Class seat that may have some extra legroom due to the bulkhead position. The tray table is in the armrest, making the armrest immovable and slightly reducing seat width. Passengers traveling with infants are often seated in this row. 15 F None No Power Seat 15 F is a Coral Economy Class seat that may have some extra legroom due to the bulkhead position. The tray table is in the armrest, making the armrest immovable and slightly reducing seat width. Passengers traveling with infants are often seated in this row. 15 G None No Power Seat 15 G is a Coral Economy Class seat that may have some extra legroom due to the bulkhead position. The tray table is in the armrest, making the armrest immovable and slightly reducing seat width. Passengers traveling with infants are often seated in this row. 15 H None No Power Seat 15 H is a Coral Economy Class seat that may have some extra legroom due to the bulkhead position. The tray table is in the armrest, making the armrest immovable and slightly reducing seat width. 15 J None No Power Seat 15 J is a Coral Economy Class seat that may have some extra legroom due to the bulkhead position. The tray table is in the armrest, making the armrest immovable and slightly reducing seat width. 15 K None No Power Seat 15 K is a Coral Economy Class seat that may have some extra legroom due to the bulkhead position. The tray table is in the armrest, making the armrest immovable and slightly reducing seat width. 16 A None No Power Seat 16 A is standard Coral Economy Class seat. 16 B None No Power Seat 16 B is standard Coral Economy Class seat. 16 C None No Power Seat 16 C is standard Coral Economy Class seat. 16 D None No Power Seat 16 D is a Coral Economy Class seat that may have limited recline and is in close proximity to the main cabin lavatories which may be bothersome. 16 E None No Power Seat 16 E is a Coral Economy Class seat that may have limited recline and is in close proximity to the main cabin lavatories which may be bothersome. 16 F None No Power Seat 16 F is a Coral Economy Class seat that may have limited recline and is in close proximity to the main cabin lavatories which may be bothersome. 16 G None No Power Seat 16 G is a Coral Economy Class seat that may have limited recline and is in close proximity to the main cabin lavatories which may be bothersome. 16 H None No Power Seat 16 H is standard Coral Economy Class seat. 16 J None No Power Seat 16 J is standard Coral Economy Class seat. 16 K None No Power Seat 16 K is standard Coral Economy Class seat. 17 A None No Power Seat 17 A is a Coral Economy Class seat that is in close proximity to the main cabin lavatories which may be bothersome. 17 B None No Power Seat 17 B is a Coral Economy Class seat that is in close proximity to the main cabin lavatories which may be bothersome. 17 C None No Power Seat 17 C is a Coral Economy Class seat that is in close proximity to the main cabin lavatories which may be bothersome. 17 H None No Power Seat 17 H is a Coral Economy Class seat that is in close proximity to the main cabin lavatories which may be bothersome. 17 J None No Power Seat 17 J is a Coral Economy Class seat that is in close proximity to the main cabin lavatories which may be bothersome. 17 K None No Power Seat 17 K is a Coral Economy Class seat that is in close proximity to the main cabin lavatories which may be bothersome. 18 A None No Power Seat 18 A is a Coral Economy Class seat that may have some extra legroom due to the exit row. The tray table is in the armrest, making the armrest immovable and slightly reducing seat width. Passengers may also congregate near this seat while waiting to use the lavatories. 18 B None No Power Seat 18 B is a Coral Economy Class seat that may have some extra legroom due to the exit row. The tray table is in the armrest, making the armrest immovable and slightly reducing seat width. Passengers may also congregate near this seat while waiting to use the lavatories. 18 C None No Power Seat 18 C is a Coral Economy Class seat that may have some extra legroom due to the exit row. The tray table is in the armrest, making the armrest immovable and slightly reducing seat width. Passengers may also congregate near this seat while waiting to use the lavatories. 18 D None No Power Seat 18 D is a Coral Economy Class seat that may have some extra legroom due to the exit row. The tray table is in the armrest, making the armrest immovable and slightly reducing seat width. Passengers may also congregate near this seat while waiting to use the lavatories. Passengers traveling with infants are often seated in this row. 18 E None No Power Seat 18 E is a Coral Economy Class seat that may have some extra legroom due to the exit row. The tray table is in the armrest, making the armrest immovable and slightly reducing seat width. Passengers may also congregate near this seat while waiting to use the lavatories. Passengers traveling with infants are often seated in this row. 18 F None No Power Seat 18 F is a Coral Economy Class seat that may have some extra legroom due to the exit row. The tray table is in the armrest, making the armrest immovable and slightly reducing seat width. Passengers may also congregate near this seat while waiting to use the lavatories. Passengers traveling with infants are often seated in this row. 18 G None No Power Seat 18 G is a Coral Economy Class seat that may have some extra legroom due to the exit row. The tray table is in the armrest, making the armrest immovable and slightly reducing seat width. Passengers may also congregate near this seat while waiting to use the lavatories. Passengers traveling with infants are often seated in this row. 18 H None No Power Seat 18 H is a Coral Economy Class seat that may have some extra legroom due to the exit row. The tray table is in the armrest, making the armrest immovable and slightly reducing seat width. Passengers may also congregate near this seat while waiting to use the lavatories. 18 J None No Power Seat 18 J is a Coral Economy Class seat that may have some extra legroom due to the exit row. The tray table is in the armrest, making the armrest immovable and slightly reducing seat width. Passengers may also congregate near this seat while waiting to use the lavatories. 18 K None No Power Seat 18 K is a Coral Economy Class seat that may have some extra legroom due to the exit row. The tray table is in the armrest, making the armrest immovable and slightly reducing seat width. Passengers may also congregate near this seat while waiting to use the lavatories. 2 A None No Power Seat 2 A is a standard Diamond First Class seat. 2 D None No Power Seat 2 D is a standard Diamond First Class seat. 2 G None No Power Seat 2 G is a standard Diamond First Class seat. 2 K None No Power Seat 2 K is a standard Diamond First Class seat. 27 F None No Power Seat 27 F is a standard Coral Economy Class seat. 28 F None No Power Seat 28 F is a standard Coral Economy Class seat. 30 A None No Power Seat 30 A is a Coral Economy class seat that is in close proximity to the main cabin galley which may be bothersome. 30 B None No Power Seat 30 B is a Coral Economy class seat that is in close proximity to the main cabin galley which may be bothersome. 30 C None No Power Seat 30 C is a Coral Economy class seat that is in close proximity to the main cabin galley which may be bothersome. 30 D None No Power Seat 30 D is a Coral Economy class seat that is in close proximity to the main cabin galley which may be bothersome. 30 G None No Power Seat 30 G is a Coral Economy class seat that is in close proximity to the main cabin galley which may be bothersome. 30 H None No Power Seat 30 H is a Coral Economy class seat that is in close proximity to the main cabin galley which may be bothersome. 30 J None No Power Seat 30 J is a Coral Economy class seat that is in close proximity to the main cabin galley which may be bothersome. 30 K None No Power Seat 30 K is a Coral Economy class seat that is in close proximity to the main cabin galley which may be bothersome. 31 D None No Power Seat 31 D is a Coral Economy Class seat that is in the last row of the section and also close proximity to the main cabin galley which may be bothersome. 31 E None No Power Seat 31 E is a Coral Economy Class seat that is in the last row of the section and also close proximity to the main cabin galley which may be bothersome. 31 F None No Power Seat 31 F is a Coral Economy Class seat that is in the last row of the section and also close proximity to the main cabin galley which may be bothersome. 31 G None No Power Seat 31 G is a Coral Economy Class seat that is in the last row of the section and also close proximity to the main cabin galley which may be bothersome. 32 A None No Power Seat 32 A is a Coral Economy Class seat that may have some extra legroom due to the bulkhead position. The tray table is in the armrest, making the armrest immovable and slightly reducing seat width. 32 B None No Power Seat 32 B is a Coral Economy Class seat that may have some extra legroom due to the bulkhead position. The tray table is in the armrest, making the armrest immovable and slightly reducing seat width. 32 C None No Power Seat 32 C is a Coral Economy Class seat that may have some extra legroom due to the bulkhead position. The tray table is in the armrest, making the armrest immovable and slightly reducing seat width. However, the light and noise coming from the main galley may be bothersome. 32 H None No Power Seat 32 H is a Coral Economy Class seat that may have some extra legroom due to the bulkhead position. The tray table is in the armrest, making the armrest immovable and slightly reducing seat width. However, the light and noise coming from the main galley may be bothersome. 32 J None No Power Seat 32 J is a Coral Economy Class seat that may have some extra legroom due to the bulkhead position. The tray table is in the armrest, making the armrest immovable and slightly reducing seat width. 32 K None No Power Seat 32 K is a Coral Economy Class seat that is missing a window, but may have some extra legroom due to the bulkhead position. The tray table is in the armrest, making the armrest immovable and slightly reducing seat width. 33 C None No Power Seat 33 C is a Coral Economy Class seat in close proximity to the main galley. The light and noise coming from the galley may be bothersome. 33 H None No Power Seat 33 H is a Coral Economy Class seat in close proximity to the main galley. The light and noise coming from the galley may be bothersome. 34 D None No Power Seat 34 D is a Coral Economy Class seat that may have some extra legroom due to the bulkhead position. The tray table is in the armrest, making the armrest immovable and slightly reducing seat width. Passengers traveling with infants are often seated in this row. 34 E None No Power Seat 34 E is a Coral Economy Class seat that may have some extra legroom due to the bulkhead position. The tray table is in the armrest, making the armrest immovable and slightly reducing seat width. Passengers traveling with infants are often seated in this row. 34 F None No Power Seat 34 F is a Coral Economy Class seat that may have some extra legroom due to the bulkhead position. The tray table is in the armrest, making the armrest immovable and slightly reducing seat width. Passengers traveling with infants are often seated in this row. 34 G None No Power Seat 34 G is a Coral Economy Class seat that may have some extra legroom due to the bulkhead position. The tray table is in the armrest, making the armrest immovable and slightly reducing seat width. Passengers traveling with infants are often seated in this row. 40 C None No Power Seat 40 C is a Coral Economy Class seat that protrudes slightly and may get bumped by passengers walking down the isle due to transition from 2 to 3 seats. 40 H None No Power Seat 40 H is a Coral Economy Class seat that protrudes slightly and may get bumped by passengers walking down the isle due to transition from 2 to 3 seats. 41 F None No Power Seat 41 F is a standard Coral Economy Class seat. 42 F None No Power Seat 42 F is a standard Coral Economy Class seat. 44 D None No Power Seat 44 D is a Coral Economy Class seat in close proximity to the rear lavatories which may be bothersome. 44 G None No Power Seat 44 G is a Coral Economy Class seat in close proximity to the rear lavatories which may be bothersome. 45 A None No Power Seat 45 A is a Coral Economy Class seat in the last row. This seat is in close proximity to the rear lavatories which may be bothersome. 45 C None No Power Seat 45 C is a Coral Economy Class seat in the last row. This seat is in close proximity to the rear lavatories which may be bothersome. 45 D None No Power Seat 45 D is a Coral Economy Class seat in the last row that may have limited recline. This seat is in close proximity to the rear lavatories which may be bothersome. 45 E None No Power Seat 45 E is a Coral Economy Class seat in the last row that may have limited recline. This seat is in close proximity to the rear lavatories which may be bothersome. 45 F None No Power Seat 45 F is a Coral Economy Class seat in the last row that may have limited recline. This seat is in close proximity to the rear lavatories which may be bothersome. 45 G None No Power Seat 45 G is a Coral Economy Class seat in the last row that may have limited recline. This seat is in close proximity to the rear lavatories which may be bothersome. 45 H None No Power Seat 45 H is a Coral Economy Class seat in the last row. This seat is in close proximity to the rear lavatories which may be bothersome. 45 K None No Power Seat 45 K is a Coral Economy Class seat in the last row. This seat is in close proximity to the rear lavatories which may be bothersome. 5 A None No Power Seat 5 A is a standard Pearl Business Class bulkhead seat. 5 E None No Power Seat 5 E is a standard Pearl Business Class bulkhead seat. 5 F None No Power Seat 5 F is a standard Pearl Business Class bulkhead seat. 5 K None No Power Seat 5 K is a standard Pearl Business Class bulkhead seat. 6 D None No Power Seat 6 D is a standard Pearl Business Class seat. However, there may be noise in this area due to the proximity to the galley. 6 G None No Power Seat 6 G is a standard Pearl Business Class seat. However, there may be noise in this area due to the proximity to the galley. 7 A None No Power Seat 7 A is a Pearl Business Class bulkhead seat that may be bothersome because of the proximity to the lavatory. The light from the galley may disturb passengers sitting here on overnight flights. 7 E None No Power Seat 7 E is a Pearl Business Class bulkhead seat that may be bothersome because of the proximity to the lavatory. The light from the galley may disturb passengers sitting here on overnight flights. 7 F None No Power Seat 7 F is a Pearl Business Class bulkhead seat that may be bothersome because of the proximity to the lavatory. The light from the galley may disturb passengers sitting here on overnight flights. 7 K None No Power Seat 7 K is a Pearl Business Class bulkhead seat that may be bothersome because of the proximity to the lavatory. The light from the galley may disturb passengers sitting here on overnight flights. 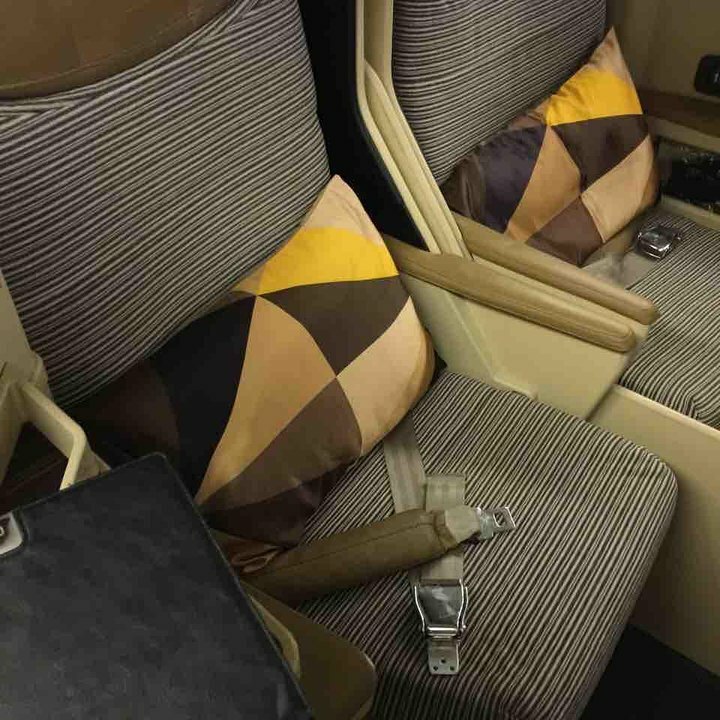 Etihad flies three versions of the Boeing 777-300ER. The older versions fly in a 2 class configuration and the newer aircraft fly in a three class configuration. 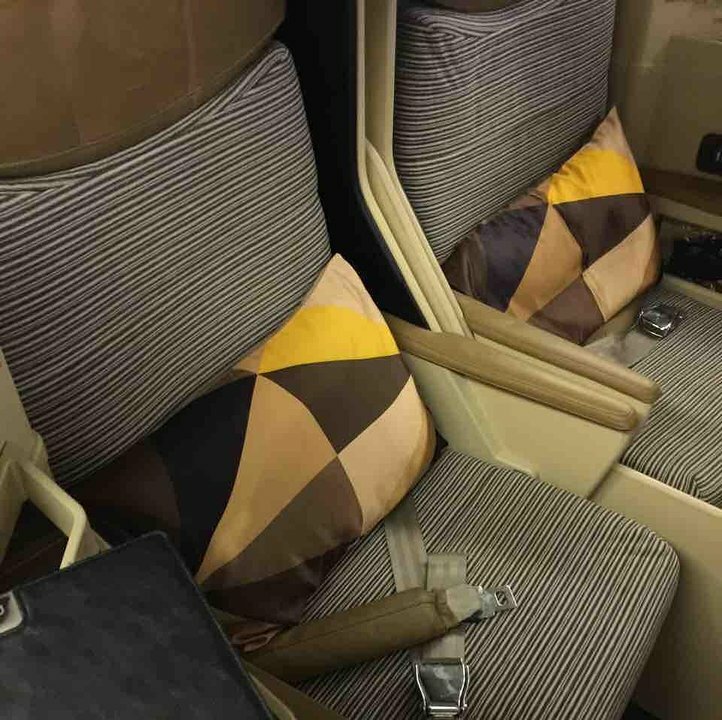 This version of the aircraft is configured in three classes with 8 seats in Diamond First, 40 seats in Pearl Business Class, and 282 seats in Coral Economy Class. 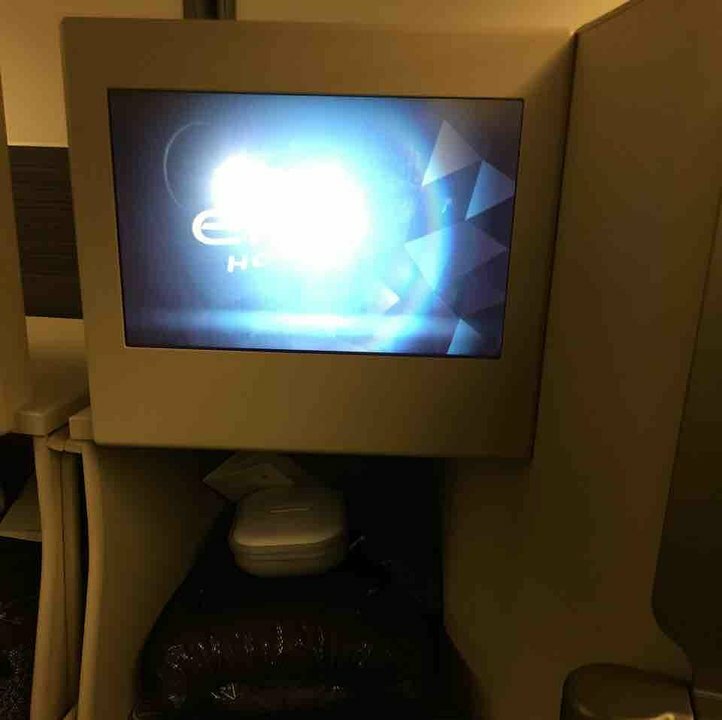 Etihad Airways uses the following naming convention: Diamond First for First Class, Pearl Business for Business Class, and Coral Economy for Economy Class. This is the worst flight i have ever been on. This was a london to abu dhabi flight, 7 hours. Firstly my seat has two steel bars from front to back which i could feel when i sat down and was very uncomfortable. The seat space for a business seat was cramped. I will avoid this aircraft at all cost in future. As i was told the flight was full, i was given an extra blanket to put on the seat but nothing other than that was done to help. Very disappointing for a business class seat which was not cheap. 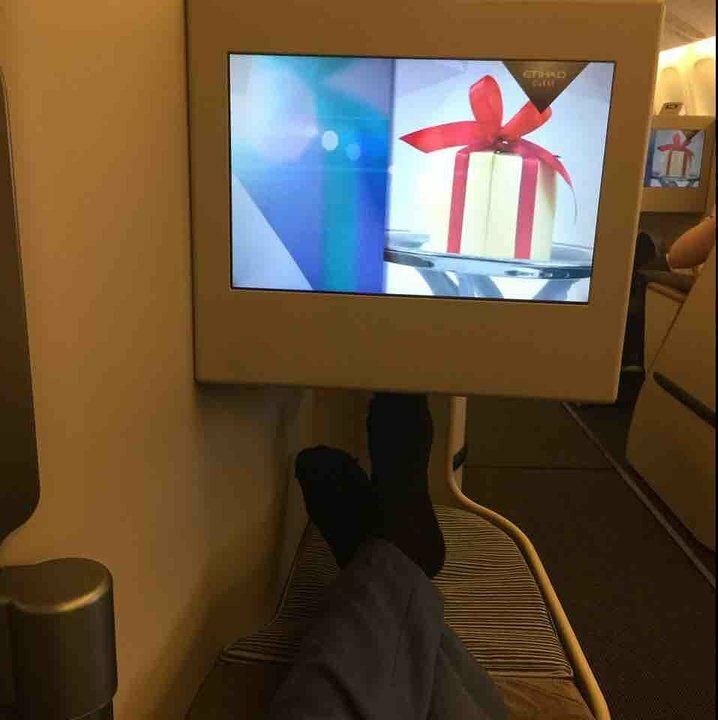 I received a free upgrade from business to first on the flight from melbourne to abu dhabi. It was a lovely surprise at the gate. Considering this is an older aircraft that hasn't had the interior remodeled. As such there is a big difference between classes. First class with an on board chef and dine any time was a wonderful service on this ling flight. I ended up getting 6 hours of deep continuious sleep with the lie flat bed including proper matress, pillow and doona. The worst airline seat I've ever had the misfortune to sit in (one of the middle two seats in a row of four.) Have honestly been more more comfortable in Ryanair, Monarch, jet2 seats. Like other reviewers I don't believe the advertised seat pitch and width ! For a seven hour flight, totally unacceptable. The flight attendants were fabulous and the food was fine, but the terrible cramped nature of these seats would seriously be enough to put me off any economy flight where this aircraft was being used in future! I was travelling with my oh who sat in 11E. These seats were great, you had loads of room and I was able to sleep for a lot of the 14 hour flight. Folds down into flat bed and had plenty of room. Flew on this plane from AUH to MEL and then SYD to AUH. Good seats if you are travelling with a partner. Plenty of room to the outside of 42 H to stretch out. Service was really good, we were kept full and hydrated throughout both flights. IFE was surprisingly good. We sat in 44 H, K on the way back, seemed to be marginally less space but still worth it if there are just two of you travelling. It is the worst exit seat i have sat in. I could not stretch my legs out fully due to position of bit coming out from exit door. But worse, I have never sat in such a narrow seat, I believe narrower than the middle and aisle seats next to me I would certainly avoid, and I think a caution should be put on it. I flew from Dusseldorf to Abu Dhabi and back on the 30th of March, and 21st of April, 2016. I had won the first class seat on a lottery while I paid for the flight back. The first class seat was amazing. Great services and enjoyable IFE. Overall great experience. However coming back in 35H wasn't as pleasant. Although the FAs were very welcoming my seat felt to cramped. There wasn't enough space for me as I am 6.5. I think I will continue with flights via SWISS instead. One of the most uncomfortable flight i've experienced in a long time. There is limited leg room that squeeze your leg towards the inside. The aisle is so narrow that the carts kept bumping the seats. The crew was ok, tainted by the lady in our section who was unfriendly. I will now avoid Etihad for future flights. leg room was poor and unbearable for a 14 hour flight. I agree seats and aisle are narrow; the aisle not a problem with the pair of seats in the rear. More space between rows would allow easier access, particularly when seats in front reclined. More legroom is needed on a 13 hour flight! However the Cabin Crew were delightful and helpful. 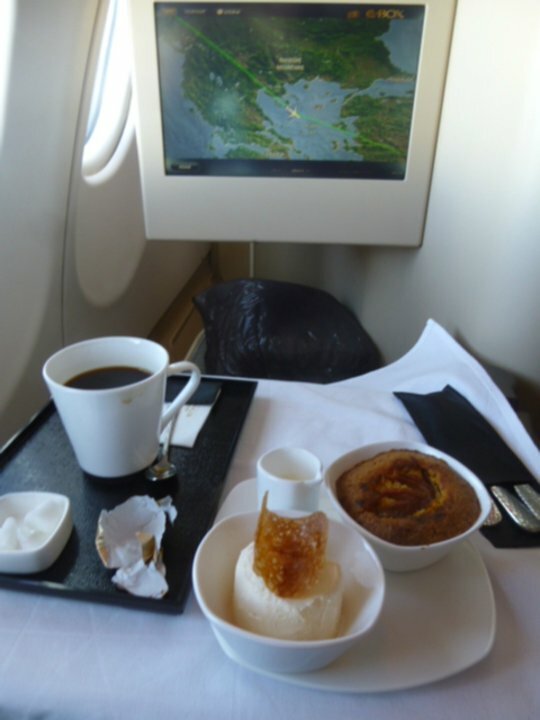 I flew first class Munich to Abu Dhabi December 2014. Ground crew in Munich were most helpful however on arrival in AD the aircraft was parked a long distance from the gate and all passenger were herded onto a bus and then dumped at the terminal. There were no ground crew to assist first or business class passengers. There are no first class lounges in the airport as fc lounge in the old terminal is closed and in the business lounge the smell of food was repulsive.The lounge in the other terminal is closed and there is a great cavern of a space for business class passengers where children play on the floor or on the computers. I have flown with this airline many times and now find the experience shambolic. This is the first row of two seats after the standard three seats on the left side of the aircraft. Because of the structure of the plane, this row of seats is angled, and 41C loses a couple of inches of pitch on the right side of the seat. The same is likely for those seats on the right side of the plane. Given the cramped arrangement of seating on this aircraft, the angle into 40B makes 41C unbearable. Excellent Business Class, private seating with Aisle access each. "The Residence", is NOT on the 773, and will not arrive until December 2014 AUH-LHR. So the above comment is not true. First has individual Suites, 8 on the 773-ER that flies to Sydney along with an A346 daily, that has 12 private First Suites. The Bathrooms do Not have showers, but are spacious, one being a double size room for changing into sleepwear. they are an excellent Airline, complimentary nights when you stopover in AUH, Chauffeur transfers to and from them, and each end of your trip, and restaurants in their lounges, as well as Spa facilities. Eat as you wish on the 15 hrs Sydney flights, with a broad menu, freshly cooked by a Chef and also a Business F & B Supervisor. As a Gold FFP Guest member, they are superb, and one of the most comfortable and best serviced Airlines in First and Business class, in The World. Extremely Comfortable. I have over 2,500,000 miles of flights with many airlines. This was the best flight I've ever undertaken. Massage function in the seat was a pleasant surprise/bonus. This was the most uncomfortable flight in a long time. Enough to make me consider flying with Emirates to Dubai, then a taxi down to Abu Dhabi. It was that bad! This first class suite was even more comfortable than i expected. 10 out of 10. I agree with recent comments that Etihad economy seats are the smallest I have ever seen outside of Easyjet, Ryan Air etc. I am over 6' tall and find their seats extremely narrow and small. You only have to compare this aircraft with a British Airways 777ER. In economy they only fir in 9 seats across the width of the plane making seating more comfortable and also wider aisles. The aisles on Etihad have to be at the safety standard minimum. I have never flown on Etihad yet and not had my seat rammed by a trolley at least once. I found this aircraft to have one of the smallest seats in any scheduled flight I have been on - more like charter flight room or the worst of BA 747s. This is a nice aircraft and among the best Economy seats. Down side is at 10 across the aisles are very small so the catering trolly crashes into every isle seat. The extra legroom is very good, so I found this long flight very comfortable.